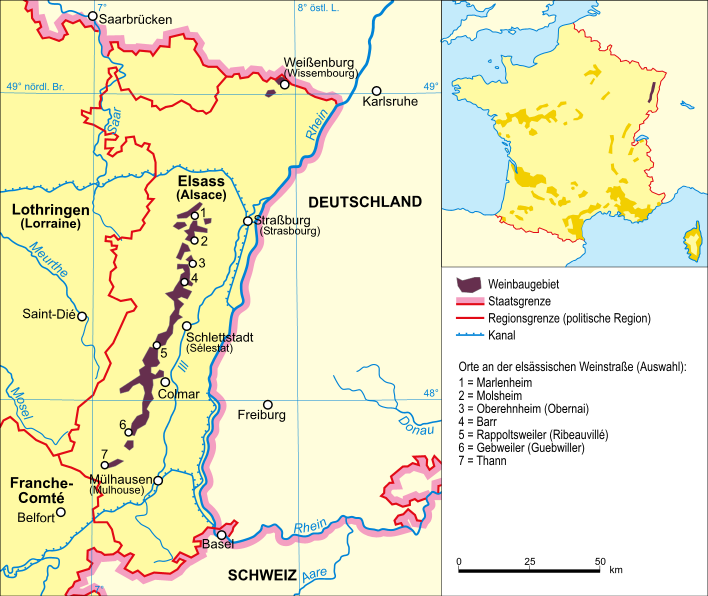 The winegrowing region lies in the northeast France at the by the Rhine formed border too Germany, The Bas-Rhin and Haut-Rhin départements formed their own French administrative region, Alsace (Région Alsace) from 1973 to 2015. As part of the regional mergers, starting in 2016, the Grand Est (Great East) region was founded with the capital Strasbourg, which comprises the areas of Alsace, Lorraine and Champagne-Ardenne. Viticulture was already by the Celts (Gauls) operated in front of here in the 2nd century emerging Romans. After a decline in the 5th century by the invasion of the Germans, he came under the influence of the Roman Catholic monastic orders to flower again. In the 9th century, around 160 vineyards have already been documented. In the 16th century, viticulture with more than double vineyard area compared to today reached its greatest extent. At that time there was already a kind appellation system and the Alsatian wines were exported to all European countries The then winegrowers association of Riquewihr set the harvest time with "as late and ripe as possible" and the permissible "noble" grape varieties. The variety Elbling had to be torn out. The Alsatian was then considered the best German wine, often enriched with alcohol and spices flavored has been. Due to the devastation in the Thirty Years War (1618-1648), the areas were largely destroyed. Slowly, there was a boom again and by the mid-19th century, the vineyard grew to 30,000 hectares. Then also hit the phylloxera and the mildew to. The area shrank until 1950 on less than 10,000 hectares. For about seven centuries Alsace was a German territory, in 1860 it came to France, then from 1870 to 1918 it was part of the German Reich again and then counted (with a brief interruption in World War II) back to France. From 1871 to 1918 there was the imperial country Alsace-Lorraine. Due to this historical development, the Alsatian wine culture is characterized in terms of grape varieties and production German and differs greatly from the other French wine-growing regions. The vineyards cover 15,000 hectares, which extend at the foot of the Vosges in a narrow, often only two kilometers wide band from Strasbourg in the north 110 kilometers along the German border to Mulhouse in the south. The entire eastern border too Germany forms the Rhine. The Vosges on the western side strongly influence the climate. They hold most of the rain coming from the Atlantic, which is why Alsace is one of the poorest areas in France. There are cold winters, a mild spring and warm, dry summers with occurring in some years droughts, A special feature are the many different ones soil types with sand, pebbles, loess, lime, clay, slate, granite and volcanic rock. Alsace is divided into two départements. These are the better wine region called southern Haut-Rhin (Upper Rhine) and the northern Bas-Rhin (Lower Rhine). The viticulture center are some places north and south of Colmar with the famous Riquewihr. This most famous wine town is now completely listed. The 170-kilometer-long "Route du Vin" wine route from Marlenheim in the north to Thann in the south touches many of the wine-growing villages in the scenically incredibly attractive region. The "seven vines of Alsace" are the white varieties Gewurztraminer, Muscat (the two varieties Muscat Blanc and Muscat Ottonel are often used together), Pinot Blanc (also - Pinot Blanc and Auxerrois), Pinot Gris (formerly Tokay Pinot Gris - but now EU decision), Riesling and Sylvaner, and as the only red wine Pinot Noir. Of the other varieties is still Chasselas to mention, but the area has shrunk and rather simple wines yields. The Chardonnay is only for Crémants (Sparkling wines) allowed. The two traditional varieties Goldriesling and Knipperlé (Ortlieber) have no meaning. More than 90% of white wines are produced. Red wine is mainly obtained from Pinot Noir and occasionally as Blanc de noirs white pressed. At the label is the expansion (dry to sweet) not listed. There are three appellation terms. The AOC accounts for almost 75% of production. Mostly they are varietal wines from 100% of a variety indicated on the label. If this is missing, it concerns a Cuvée different varieties that as Edelzwicker (also Gentil) are marketed. A special position has the Klevener de Heiligenstein from the municipality of Heiligenstein. The AOC Crémant d'Alsace for bottle-fermented sparkling wines accounts for over 20% of production. The AOC Alsace Grand Cru applies to the 51st Grands Crus, Sweet wines have had a very long tradition in Alsace for centuries. The names "Alsace Vendange Tardive" and "Alsace Sélection de Grains Nobles" are added to Alsace or Alsace Grand Cru. It will also Vin de paille ( Strohwein ) and Vin de glace ( Eiswein ) generated. The Alsatian wines are except the Crémant in the slender Flûtes Bottled (flutes). There are well over a thousand winemakers and a number of great ones Winzergenossenschaften, Starting from the 1990s, there was a strong orientation to Biodynamic viticulture with rigorous yield reduction. About 10% of all Alsatian wines are produced by a large cooperative in Eguisheim under the brand name "Wolfberger". Other producers include Léon Beyer, Ernest Burn, Cave de Pfaffenheim, Marcel Deiss, Dirler-Cadé, Pierre Frick, Rémy Gresser, Domaine Jean-Marie Haag, Hugel et Fils, Josmeyer, Maison Jülg, Kreydenweiss, Kuentz-Bas, Seppi Landmann, André Ostertag, Martin Schaetzel, Domaines Schlumberger, Jean-Paul Schmitt, Schoffit, Vincent Stoeffler, Trimbach, Domain Weinbach and Zind-Humbrecht.